Near-Earth space involves not only risks for the earth and its inhabitants but also great potential. With the participation of the German Research Center for Artificial Intelligence (DFKI), the EU training network Stardust developed new methods for monitoring and deflecting asteroids in order to avoid collisions with the Earth. In the follow-up project Stardust Reloaded, junior researchers will again be provided with a platform to explore, with a grant of 4 million euros, how near-Earth space can be explored and used in a sustainable manner. The ever-increasing traffic in space – consisting of asteroids, thousands of active and inactive satellites, and lots of other space junk – has an unpredictable impact on near-Earth space. Although not statistically very probable, an asteroid impact on Earth would have devastating consequences for our planet. The Stardust Reloaded training network, with 20 European partners including the DFKI Robotics Innovation Center and coordinated by the University of Strathclyde, provides 15 young researchers with the chance to research the opportunities and risks of asteroids. The project is funded by the Marie Curie Initial Training Network (ITN) as part of the European Union's H2020 programme. The goal of the project is to expand our understanding of the evolution of near-Earth space, in particular, the shape, gravity, composition, and dynamics of asteroids and comets. In this context, it shall be explored how the increasing space traffic can be handled and organized in such a way that collisions with the earth, satellites and other near-Earth objects can be prevented. In addition, the project's focus is also on the sustainable use of space – a necessity for the future, which increasingly relies on space-based resources. 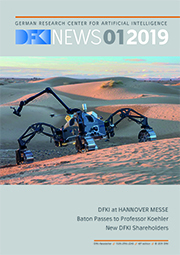 The DFKI Robotics Innovation Center, directed by Prof. Dr. Dr. h.c. Frank Kirchner, contributes to the Stardust Reloaded network, its many years of expertise in the development of mobile autonomous robots, especially, for use in hostile and extreme environments such as space, or the deep sea. The focus is on the development of a real-time control system for robotic manipulator. Mounted on unmanned satellites, manipulators can be used in rendezvous to repair satellites or remove space debris from orbit. This presents a tremendous challenge insofar that such maneuvers require a high degree of autonomy, and each movement of the manipulator affects the position and orientation of the satellite it is attached to. At the DFKI, the young researchers shall develop real-time control algorithms for a free-floating manipulator and test them under realistic conditions with the aid of an underwater vehicle.